Rare even by European Carnival standards, this elegant pattern was made by the Swedish glass manufacturer, Eda. 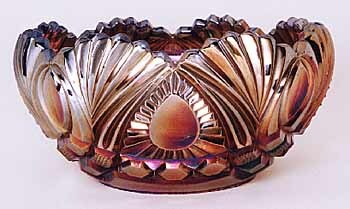 Glen and Stephen Thistlewood, in their book, A Century of Carnival Glass, report flared out bowls, straight up bowls, and this rosebowl shape. This 8-inch blue rosebowl (with pinheads) sold at a 2001 auction for $70. A marigold example, also 8 inches (and also with pinheads) brought the same price as the same auction. In 2007, a marigold rosebowl brought $25.